This time, it’s the Huskers. At home. In a conference game. It’s not just the number (Ohio State -24), but matchups. I could see Nebraska having some success in the passing game. 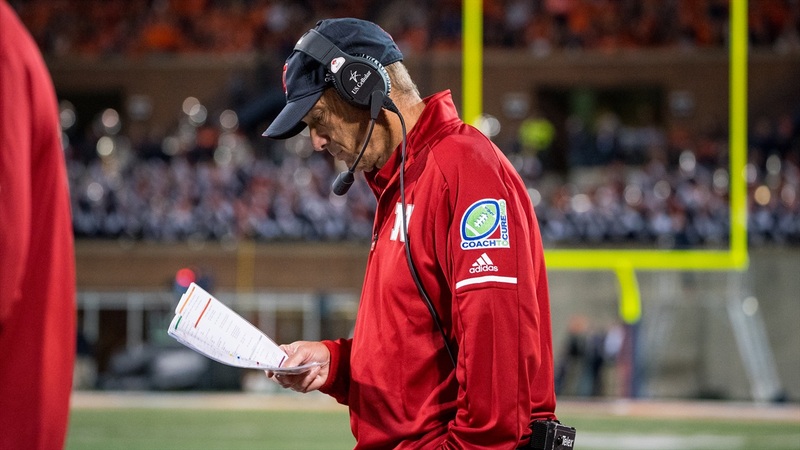 Offensive coordinator Danny Langsdorf’s passing schemes have challenged plenty of good defenses, but the Huskers will have to keep Tanner Lee upright against a pass rush with a handful of future NFLers. Odds of doing that consistently 30-to-35 times on Saturday night? Slim. I could also see the defense hanging in for a while specifically by forcing a few turnovers and field goals on its half of the field. If Bob Diaco’s Blackshirts can keep things in front of them and win deep in its own territory, maybe it “keeps the points down” somewhat against an offense averaging 45.8 points per game. The problem is Nebraska could win those scoring position battles two or three times to start the game, but one slight miss against the Buckeyes has the potential to turn into a back-breaking big play that undoes the whole thing. It feels sort of like consistently pitching out of two-on, one-out jams. The pressure to be perfect eventually takes a toll. I don’t see Nebraska doing that for 60 minutes either. Not many teams can against the Buckeyes. So if you really want to get down to how Nebraska could potentially get a win on Saturday night, I’m left with no better idea than this: It has to get weird. Huge turnover numbers. A big explosive-play differential. Those two categories (combined they’re toxic differential) are kind of random, but will usually tell you which team won the game at the end. Problem is, Ohio State is one of the best toxic differential teams in the country. While it can be difficult to totally control turnovers and big plays, the best teams usually do a good job of winning these somewhat random categories. (Alabama, for example, played its first five games this season without losing a turnover.) It’s things like that that separate great teams from good teams. Combined record for those 11 teams: 54-5. Louisville, which has an absurd amount of explosive plays on offense, but is losing the turnover battle and gives up a few too many on defense, is the only sort of surprising school in that group. Almost all the others feel like they belong. Nebraska? It’s a .500 team with what is basically a .500 toxic differential. The Blackshirts are faring a bit better than the offense to this point. Nebraska’s defensive toxic differential ranks 42nd, offensive 67th. I don’t know how the Huskers realistically boost those numbers against Ohio State, but I do know it might be the best chance Nebraska has. James Grega of Eleven Warriors looks at how much Ohio State has changed since the last time it visited Nebraska in 2011. Dan Wolken of USA Today reports that he's hearing the following names mentioned for Nebraska's AD opening: Arkansas's Jeff Long, Iowa State's Jamie Pollard and Oregon's Rob Mullens. Now that Mike Leach has a defense he's coming around on punting. ICYMI: Some key injury updates from Thursday's post-practice session and John Cook reviews the mid-week loss to Wisconsin.